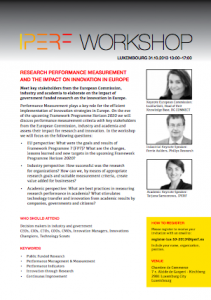 Meet key stakeholders from the European Commission, industry and academia to elaborate on the impact of government funded research on the innovation in Europe. EU perspective: What were the goals and results of Framework Programme 7 (FP7)? What are the changes, lessons learned and new targets in the upcoming Framework Programme Horizon 2020? Industry perspective: How successful was the research for organizations? How can we, by means of appropriate research goals and suitable measurement criteria, create value added for businesses? Academic perspective: What are best practices in measuring research performance in academia? What stimulates technology transfer and innovation from academic results by companies, governments and citizens? Include your name, organization, position.